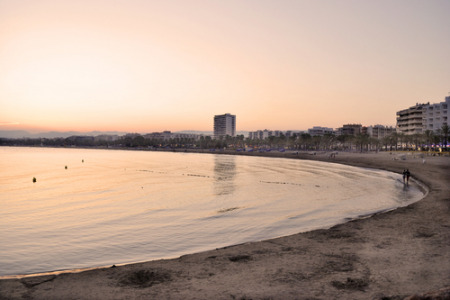 Costa Dorada, the golden coast, located south of Costa Brava, has as you'd expect, beautiful sandy beaches. With over one hundred and fifty miles of shore line, much of it sandy, it certainly deserves its name. The beaches are gently lapped by comfortably warm waters, and a variety of water sports are available at the larger resorts. Costa Dorada has resorts to suit families, couples old and young, and young adults looking for lively evening entertainment. The area offers a whole raft of tourist attractions and recreational facilities. Close to the resorts of Salou, Cambrils and La Pineda is Spain's largest theme park, Port Aventura. With its thrilling rides it is extremely popular and has over three million visitors every year. There are exciting flumes and slides at the Costa Caribe Aquatic Park as well as a scaled down version for young children. Golfers have a choice of well watered eighteen hole courses in the region. There are many traditional restaurants in the Costa Dorada as this is where many Spaniards choose to spend their annual summer break, and where Barcelona residents spend summer weekends. There is of course plenty of choice for those who prefer menus with a UK influence. Even with a cheap Costa Dorada holiday, the standard of accommodation and service are high. You can choose from all-inclusive deals to bed and breakfast or to room only. Nightlife can vary very much from resort to resort. There are those such as Salou whose clubs and discos pound out their beat until dawn, and those such as La Pineda and Cambrils, where time matters little and the pace of life is slow. The latter is renowned for its delicious fish restaurants. Costa Dorada holidays can be taken from spring until the end of autumn when the temperature remains pleasantly warm and rises into the low thirties at the height of the season. If you are looking for a cheap Costa Dorada holiday you can save yourself hours of trawling through holiday websites. As a price comparison site we search for holiday offers from almost three dozen travel companies. With such competition, you can be sure of a bargain. Our easy to use search facility will lead you to the company offering the cheap Costa Dorada holiday that is best value. Your trip to sunny shores is then only a phone call away. Interested in the Costa Dorada? This is where you’ll find handy, helpful advice and ideas that’ll save you time and money when you’re going on holiday. PortAventura World - Theme Park!